Welcome back to all of our regular customers and new customers to this 2019 season. 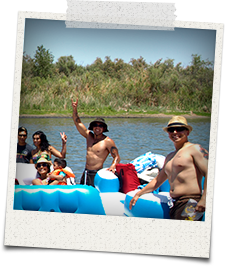 Yuma River Tubing is a small, family operated, business in Yuma. This year, we are offering two different float downs. The gila float is our 5 ml, 3 1/2 hour float and the happy hour is our 1 mile, 45-60 min float. MAKE SURE TO BOOK YOUR SPOT IN ADVANCE. SEATING IS LIMITED. Monday though Friday is by reservation only, minimum of 4 is required. Sat & Sunday from 9 am to 1 pm for Gila floats and 9 am to 5 pm for Happy Hour floats. Seating is limited. Get your reservations now!!! We go every hour on the hour. From West Wet Lands Park, we shuttle people in our vans up River to the two different drop off spots(Gila Float or Happy Hour). ALL FLOATS START AT WEST WET LANDS PARK AND ENDS AT WEST WET LANDS PARK. (We take you up river and you float down river back to us). Tubes are due in at no later than 6 pm. Extra charges may apply if return after 6 pm. The Colorado River is just a wide lazy river with scenery. There are no white caps and no elevation drops. ANYBODY CAN DO IT!!! An extra tube can be rented to carry food, snacks, and tasty beverages down the river for a cost of $10. The cooler tubes hold 64 qt sized coolers or smaller. At 5 miles long it is our longest float trip. Beginning at the confluence of the Gila, this day trip will be a wonderful relief to the harsh Arizona summer. Approximate float time is 3 - 3 1/2hrs. Join us every afternoon for HAPPY HOUR! Come join us as the sun is setting and the day is cooling off. Bring your favorite beverages and some ice and have a great float from the Ocean to Ocean bridge back to West Wetlands. This float lasts about an hour. If the water is higher we will launch from the Levy road upriver another mile. Tubes must be returned by 6pm. ATTENTION: M-F there is a minimum requirement of 4 people per group. SAT-SUN there is NO REQUIREMENT!!! Groups 20+: A down deposit will be taken to reserve your tubing trip!!! All tubes are DUE IN BY 6 P.M.!!! You must show up 15-20 min before your reserved time. If you are late, your reservation will be moved back to the next available time slot. If you would like to book a float down in the winter months, call us at (928) 750-0247. Copyright © 2014 Yuma River Tubing. All rights reserved.